Trail mix is a combination of dried fruits and nuts specially prepared for trekkers during their hiking campaigns. Sometimes chocolate is also added to a trail mix. Since these mixtures are light-weight, easy to store while being rich on energy and nutrition makes them ideal food in adventures. The use of trail mixes can be traced back to 1910s when Horace Kephart, an outdoorsman, recommended a combination of raisins, nuts and chocolate as a trail snack in his famous camping guide. Recently, we tried trail mixes from HungrySquirrel. Started by Rohan and Parul – HungrySquirrel is a product of their passion for fitness, food and adventure. Apart from trail mixes, they are experts in various products ranging from different edible seeds, nuts and dry fruits. The trail mixes we tried are Power Booster, Raw Energy and Protein Pack. 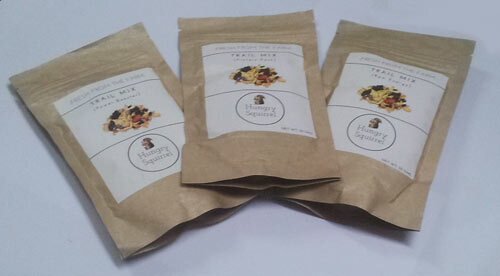 Power Booster pack contains dried apricots, dried figs roasted almonds, flax seeds, coconut shave and walnuts. Not only is the pack delicious but also rich on energy balanced with proteins, making it an excellent choice for energy during hiking. A serving of 30g contains about 179 calories, 11g fats, 6g proteins, 14g carbohydrates and 5g fibre. It is priced at Rs 99.00 only for a 50g packet. Raw Energy pack contains cashews, pumpkin seeds, melon seeds, raisins, cranberries, walnuts. This trail mix is useful when you’re in need of instant energy. The pack of 30 g contains about 154 calories, 4g protein, 12g carbohydrates, 10g fats, and 5g fibre. It is also priced at Rs 99.00 for a 50 g packet. Protein Pack contains almonds, walnuts, flax seeds, and chia seeds. 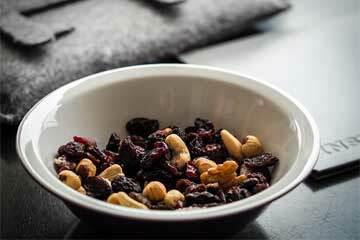 This trail mix is richer in protein along with sufficient amount of energy. The pack of 30 g contains 164 calories, 11g proteins, 7 g carbohydrates, 12 g fats, and 5g fibre. It is priced at Rs 129.00 only for a 50g packet. The products are packaged in brown paper bags, thus you won’t have to worry about littering polybags all over. The bags are also provided with grip seal so that you can use as much as you want and then seal the bag airtight to avoid spilling and contamination. So, if you’re planning a hiking trip in near future do not forget take along your trail mix packs. You can easily buy them online at http://hungrysquirrel.in.